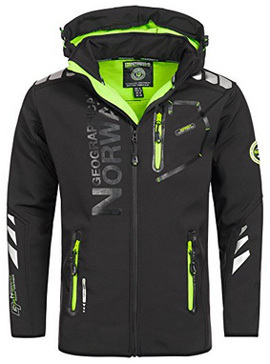 Getting to know the details of a jacket that you are looking to purchase is the first step in ensuring that you are getting the right jacket for you. One key element of a jacket, aside from its performance, is the fabric it is made of. The more expensive and the more specialized the type of jacket you are looking for, the higher the performance of its fabric. In a previous article, we discussed the differences between Nylon and Polyester, as being the two main types of fabrics used in jackets. Today we will be focusing solely on Polyester and take a better look at its qualities and the reason why it is so used in the making of jackets. 2. How is Polyester Fabric Made? 3. Characteristics of Polyester Fabric: Why Is It So Widely Used? 4. 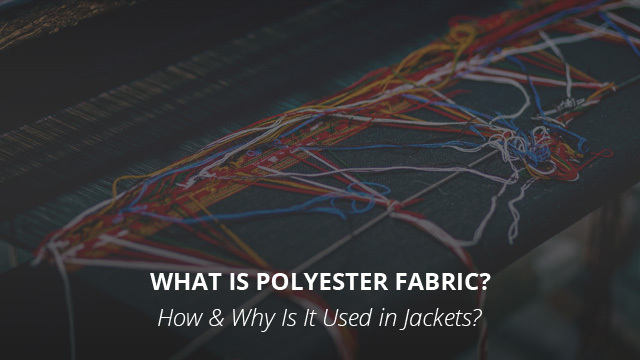 Why is Polyester Used in Jackets? 5. How is Polyester Used in Jackets? The history of polyester dates all the way back to 1941, when it was first developed, and it is a polymer composed of an ester, a terephthalic acid and a dihydric alcohol. Going by its composition alone, you can see where the name comes from, that is from its ester, which is the building block of the polyester fibers. Poly, meaning “many” in Greek, and Ester, thus many esters together. As a material, polyester serves many purposes and it is not just used as a fabric. In fact, it is a thermoplastic polymer, and as such it is used in other plastic products, such as food containers, disposable bottles and even for photographic films. Thus, in short, it is a thermoplastic polymer which, depending on how it is processed, it can be made into different products. By now you know what polyester is composed of. In regards to its chemistry, it is a result of the reaction between a dicarboxylic acid and a dihydric alcohol. After that, to turn into fibers, it is melt-spun, which is a process that makes it possible for the fibers to be made in different shapes, thickness and length. During this process, the plastic is heated and then it goes through spinnerets, which then results into polyester fibers. Then, these fibers are altered, stretched and further processed, to finally become polyester yarn, which is what is actually used for polyester fabrics. With the advanced technology of fabric production, there are numerous types of polyester fibers available for use, ranging from coarse and stiff ones, to those that look and feel like natural fibers. One such type of polyester fabric is microfiber, a very soft and gentle fabric that is used in many types of different garments and products. Durability: fibers made out of polyester are extremely durable, because the material is resistant to many chemicals and typical levels of heat (very high heat can actually damage polyester by “melting” it). It is also resistant against abrasions. Resiliency: it is renowned for maintaining its shape, this due to the fact that it is not really a stretchy material. Anti-wrinkle: it is an anti-wrinkling material, which does not really give in to wear. Resistant to mildew: an issue found in natural fibers, mildew is not a problem for polyester, since it is not just a synthetic material, but it is also hydrophobic. Hydrophobic nature: this is a key characteristic of polyester, as it makes the fibers able to withstand water due to their very low absorbency. Easy to wash: this is a very important quality when it comes to clothing and due to polyester being so easy to maintain, since it is generally a machine-washable fabric, it certainly adds to its popularity. While the above qualities of polyester fabric give an indication as to why it is so widely used in jackets, we would like to elaborate on them some more to better understand the function of this material. Polyester fibers are highly resistant to a number of weak and strong acids at room temperature, moderate resistance to alkalies at room temperature and really good resistance against solvents, including those that would typically harm other fabrics. Some of these solvents include organic solvents, stain removal ones, as well as bleaching and oxidizing agents. There are, however, mixtures of phenol and trichloromethane, as well as m-cresol which dissolve and destroy the fibers. Soaps and detergents also have no damaging effect on polyester, which is what makes these fabrics so easy to clean. Polyester is also very resistant to sunlight, it does not fade or tint from it. 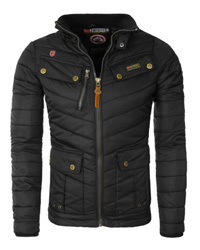 This is a great quality when it comes to jackets, which spend a considerable time under the sun. Moisture wicking is one of the key features of polyester fabrics, which is why it is used in high-performance jackets that are made for strenuous sports and activities. Due to its hydrophobic nature, which in turn causes the fibers to absorb very negligible amounts of moisture, if any, and thus it allows it to move through the fibers and leave the inside of the jacket. Weather resistance is also a bit better in polyester fibers when compared to nylon, for example, and this is due to the fibers’ dislike for water. They are less likely to wet out and are able to fare a bit better in rain, even after the DWR treatment has worn out. Quick – drying is another quality of polyester fabrics that is a result of the hydrophobic nature of polyester fibers. Because they are non-absorbent, the drying process is quite fast. This works well should it happen to rain all of a sudden, as the jacket will dry a lot more easily. A fabric that does not give in to wear and tear easily is quite useful when it comes to outdoor activities, which is another reason that polyester is used in jackets. 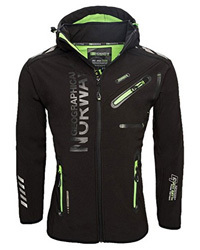 Resistance to abrasions is also a key quality, since it means a longer lasting jacket. You know why it is used in jackets, so let’s take a quick look at how it is used. Depending on the type of jacket, polyester fabric can either be used on its own, as a blend with cotton for added crease resistance, or usually used together with spandex and other elastic fibers. The reason for its blend with elastic fibers is because polyester itself is not really stretchable, which would make the wear of jackets that are made for agility and movement quite uncomfortable. 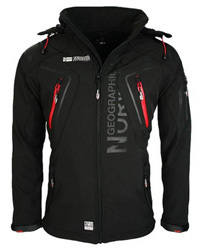 Softshell jackets are the ones where elasticized fibers are most commonly found along with polyester. Since these are the jackets that are also typically the most breathable ones, the use of polyester is key in aiding with breathability due to its moisture wicking abilities. 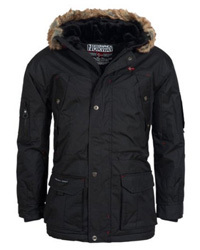 Another very important way that polyester is utilized in jackets, is fabric technology. These are specialized fabrics, which provide high levels of performance, such as complete weather-resistance, wind-resistance, high breathability and are more durable than typical fabrics. In this case, polyester fabric is used along with a specialized membrane in order to create laminates of different layers, which are then used in different types of jackets. As with any other fabric out there, polyester is not perfect either. Its main downfalls are its oleophilic nature and its tendency to pill. While the oleophilic nature of polyester is a characteristic exhibited by all types of polyester fabrics, the tendency to pill depends on the quality of the fibers used, meaning that the higher quality ones are actually anti-pilling and will not lose their appearance over time. By oleophilic nature it is meant the affinity that polyester has for oils and oil-based stains. This results in polyester retaining body odor due to sweat and being notoriously difficult to clean if it comes into contact with an oil-based stain. To counter this problem, there are stain-resistant products available, which help in protecting the fibers on the jacket, and even specially-treated polyester that is able to resist stains of all types. To summarize all of this in short, the reason polyester is used in jackets comes down to its physical and chemical attributes, high durability, weather-resistance and its moisture-wicking qualities.